Will has been really poorly with an ear infection. It’s the first time he has been properly unwell (thankfully) and it has been horrible. He had a fever that wouldn’t come down with painkillers and it worried me a lot. As a pharmacist, I thought I would be calm and controlled when my child was ill but if anything it makes me even more neurotic! 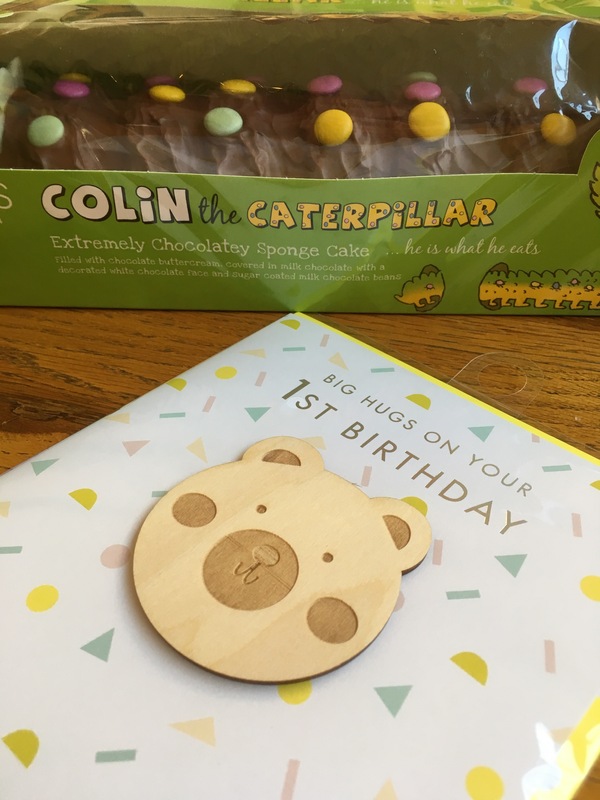 I also, despite being surrounded by medicines every day, hate to give him things if I can avoid it, so when he was given antibiotics I was weirdly disappointed – a completely stupid emotion as within two doses he had perked up no end and his temperature was back to normal. There is such negative stigma attached to antibiotics and it’s completely unfounded; of course they should only be used when needed, but when they are needed they are incredible, life saving medicines that we should thank our lucky stars for! Although he has been feeling better, he still hasn’t been his usual bubbly self and its been upsetting to see. Anyway, as I was feeling hopeless at making my little man feel better I focussed on what I could do, making him some soothing, nutritious food. Soup is my go-to food when anyone is ill. Its quick to make, comforting, healthy and can be eaten at literally any time of day. 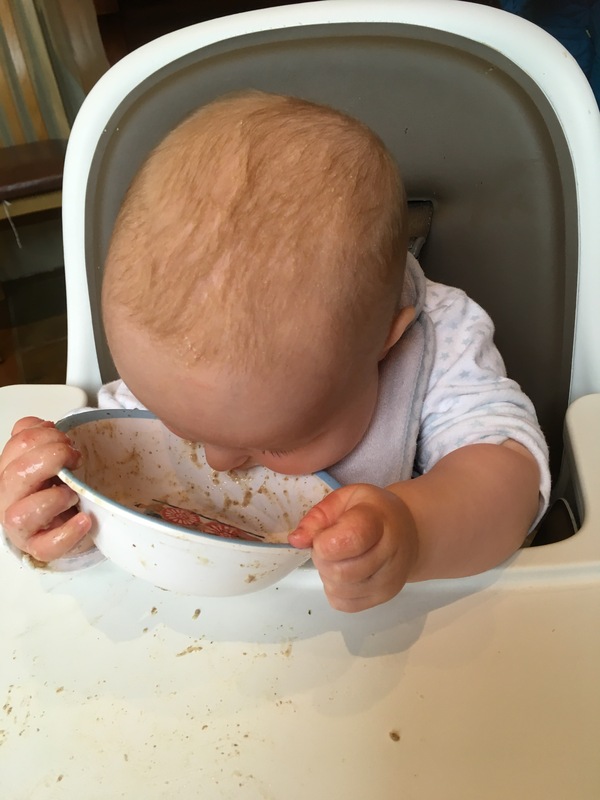 Soups have always been a regular meal in our house, but even more so since we became parents. I love to batch cook soups and freeze portions to have for lunches or late suppers. 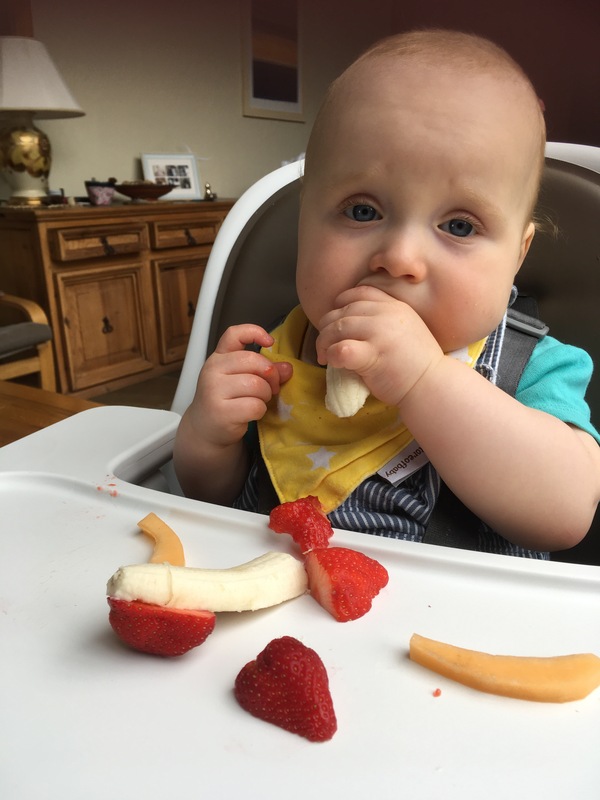 Its also great to have something that is quick to reheat and can be eaten with one hand (or put in a mug when you have a cluster feeding newborn)! This particular soup is a firm favourite in our house. It really showcases summer vegetables so it is perfect for this time of year. 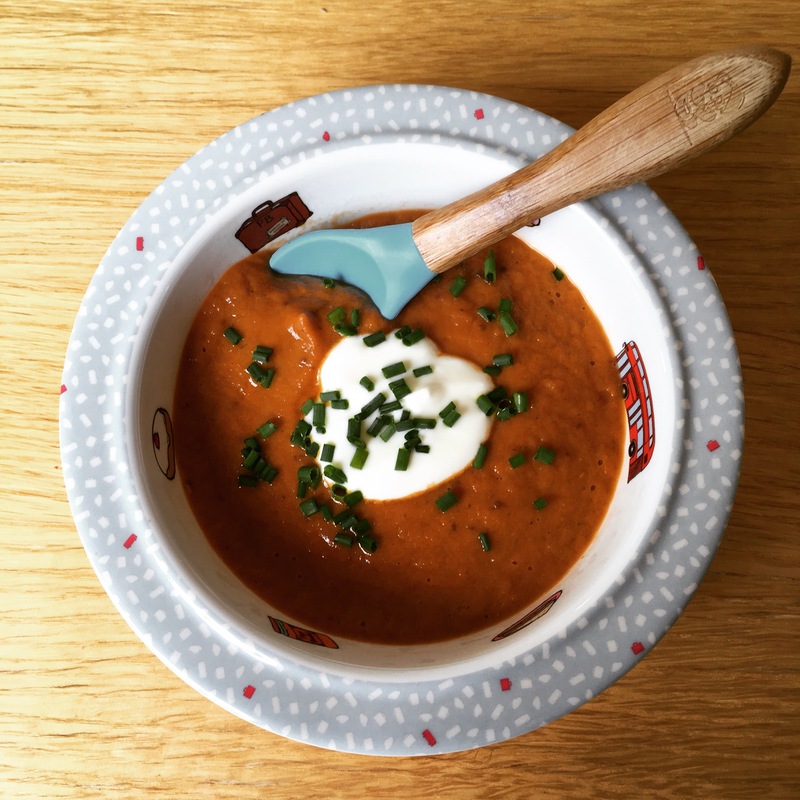 The aubergine gives the soup a wonderful creamy texture which works beautifully to cut through the acidity of the tomatoes without having to add sugar. This soup is also able to make even the most tasteless, unripe supermarket tomatoes taste delicious. Although it goes without saying that the better your tomatoes, the better the flavour will be. 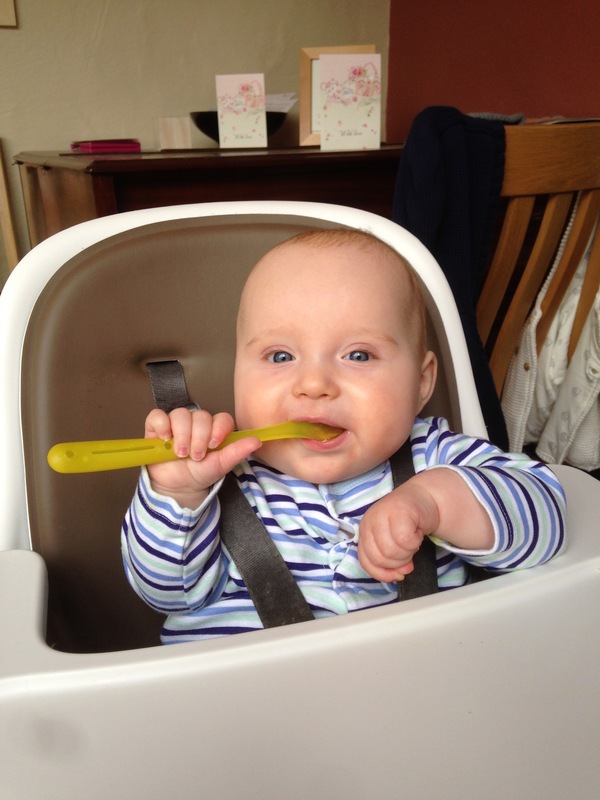 Soups are also a marvellous way of sneaking extra vegetables into children or babies. I spoon-feed Will food like this (my kitchen or my type A personality wouldn’t cope if he fed himself soup!) To encourage him to feed himself as well, I give him bread soldiers that have been dunked in the soup for him to chew on. I also added some live natural yoghurt to Will’s to give him back some of the good bacteria the antibiotics may have taken! Any leftovers can obviously be frozen but this soup also works perfectly as a pasta sauce, two recipes in one! Season to taste and blend, adding water until you reach your desired consistency. This obviously isn’t an adult bowl of soup, but ours was eaten very late and I was too hungry for the camera!